Kids’ rugby festivals, for the uninitiated, involve multiple teams playing a bunch of games throughout a day. A day in this case lasted from 9.30 to about 3.30. Thankfully the weather was pretty much OK, but from my nephew’s experience, I know they can involve long Saturdays or Sundays spent sitting and standing around on windswept, wet playing fields. That’s for the future, I’m sure. Today the lad had his first rugby festival experience down in leafy Surrey right near an idealistic little development called Whiteley Village, a place where Postman Pat wouldn’t look out of place. 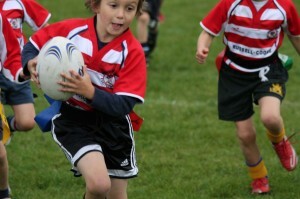 He was part of Rosslyn Park’s Under 7 team playing tag-rugby, hence those tags in the pictures. Very much like flag football for our US-based readers.